Donnelly, Kristin. Modern Potluck: Beautiful Food To Share. New York, USA: Clarkson Potter/ Publishers. 2016. Certainly not your typical church-potluck cookbook, Modern Potluck brings the potluck supper current. With a modern trend toward sustainability, more vegetable and plant-based items in meals, and an open inclusion of food from around the world, food writer and recipe developer, Kristin Donnelly, shares her contemporary reinvention of the potluck supper. Included with the recipe instructions, there are also hints and tips, accompanying photographs, and personal briefings on each recipe. From snacks, dips and drinks, to salads, main dishes and sides, the recipes and ingredients span slow-cooked meals, casseroles, sauces, and of course, sweets. As the modern manner of eating changes, so too, must the cookbooks. 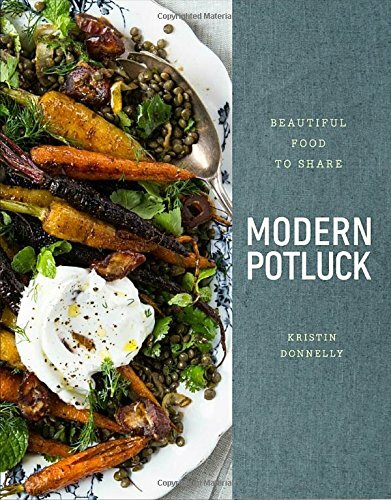 As a result, author Krisitn Donnelly takes the stereotypic potluck suppers into the present stage of cooking. With added vegetables, less processed foods, creative ingredients, additional seasonings as well as family friendly options with ease, Modern Potluck looks and cooks differently. Allowing for special-diet options (gluten-free, vegan, low sodium), these recipes are easily adaptable to any lifestyle, needs and preferences. Favorites recipes? Green Things and Potato Salad (potatoes, asparagus, and sugar-snap peas in lemon sauce) and Sweet-Spicy-Salty Snack Mix (popcorn, rice cakes, pumpkins seeds and sunflower seeds in a delicious sauce). Absolutely a book I will use often and recommend. This entry was posted in Cookbook, Healthy Lifestyle and tagged Cookbook, Cooking, Dinners, Eating, Food Photography, Healthy, Healthy Eating, Inspirational, Kristin Donnelly, Photography, Potluck, Potluck Suppers, Recipes by Savurbks. Bookmark the permalink.